Dover Cruise terminal is about 75 miles from Central London. It is one of three ports used by cruise ships visiting the London area. The others are Southampton and Harwich, both a similar distance from London as Dover. There are two main cruise terminals at Dover, Terminal 1 and Terminal 2. The largest ships tend to use Terminal 2. The cruise terminals are disabled friendly. Often disabled access taxis can found at the terminal. The Dover Cruise Terminal used to be a railway station and is still easily recognizable as such. Car parking is available around the corner, making Dover a great departure port. Click here for all transportation to London and its airports. Printable map of Dover to take along on your cruise. Dover is one of the world's premier seaports, as well as the leading cross channel port in the UK. For centuries the gateway to England, Dover and it's surrounding area makes a great day out. Full of history and splendor, including and medieval town center buildings, as well as the famous White Cliffs. Shuttles are run when cruise ships are in port. 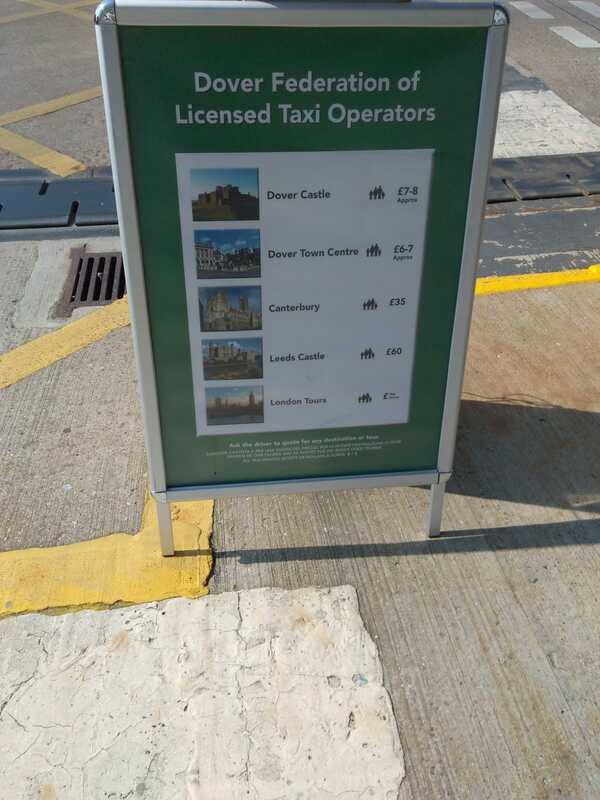 5 pounds to the town center and Dover Castle. (Euro and USD accepted). The Buses run every 20 minutes from 8am until 18:00 (last return from the Market Square in the Town Centre. Every hour on the hour the Bus from the Market Square takes passengers into the White Cliffs. Both are well worth a visit. The town is quaint and the Dover Castle Is truly magnificent. Entrance is Adults £18.30p Concessions £16.50p Children ( 5-15 years ) including all museums. Bus 15 or 15a leave around every 20 minutes to Canterbury. The bus station is across Poundland and next to Marks and Spencer, only a few minute walk from where the shuttle drops you off. Tour and Explore Enjoy your trip around London on the top deck of one of our double-decker buses. You almost get a birds eye view of London's famous attractions. You stop at over 80 places, so you can hop-off, explore, have lunch, then hop-on the next bus along. Your ticket is valid for 24 hours from the time that you first hop-on. The buses run from 10am until 6pm 7 days a week, 365 days a year. Free River Cruise included in the tour price. Closer by is Canterbury and well worth a visit. Take bus nr. 15 or 15X from the port - a 30-minute trip. The bus stop is about 150 meters (Pencester Road) up from where the shuttle will drop you off. The buses will run every half an hour and are about 6 pounds return good for all day travel in the area. Visa, Master card and Maestro, are accepted by most shops and restaurants. The McDonalds in the center of town has very good free WiFi facilities with special laptop tables.